Five times this week, I’ve swept up a creepy, hairy thing and five times it has returned. Or one of its family members. 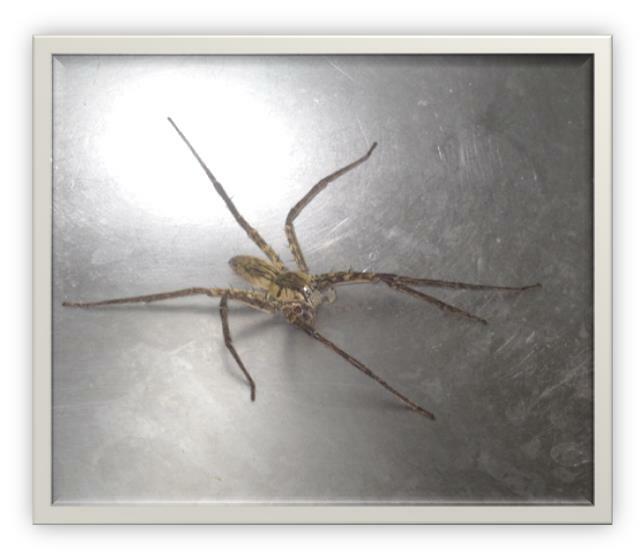 The only logical conclusion is that the Wolf Spider is my current “spirit animal”. It is an animal that presents itself to humans at precise moments representing a signal, a sign or a message to be conveyed in the form of visitations. But, really? Why couldn’t I get a brilliant Morpho butterfly or a soaring eagle or something – anything less… despised?! A toucan? A hawk? A turtle even? C’mon! Growing up in the desert and now living in Costa Rica, there are plenty of venomous pests roaming about requiring relocating. Spiders, snakes, scorpions. The big three. Historically, I’ve had absolutely zero problem with the last two. Spiders on the other hand, I never really had to deal with. Until now. They’re just so freakin’ BIG. Bigger than my hand. Bigger than the glass jar I usually use to scoop things up and throw out the door. And not just big bodies, but long, long legs that I’m sure run a hell of a lot faster than they let on. So, rather than get all freaked out, I’ve decided to ask myself what these spiders are trying to tell me. Why are there so many at once in one area? What is the significance of spiders historically speaking? Is there a spidey-sense I am missing? Some secret spider symbolism I’m not yet privy to? First thing that comes to mind is that spiders are creepy. Most people think so. Even people who like snakes think spiders are. It must be tough to be so creepy to so many people. Like being a dentist. Nearly everyone hates going to the dentist. But we need them, and spiders do serve a purpose. They eat other bugs which is useful especially in the house. I now have sympathy for the spider I didn’t have before. The next thing is that if everything in nature serves a purpose then the spider deserves to be honored and cherished just as much as the honey bee. It’s easy to see the beauty of a butterfly or to marvel in the splendor of the dragonfly’s flight. Not so with the creepy crawly spider. It occurs to me now that all creatures are awe inspiring and amazing each in their unique ways and it takes all kinds to make a planet. It takes all of us to make a healthy ecosystem. Luckily, I was able to identify this one as the non-aggressive Wolf Spider or Wandering Spider as the species is commonly known. There are spiders who make webs and there are wanderers. The Orb Weaver for instance, designs beautifully powerful intricate webs and also happens to reside outside the kitchen window of this house. By the way, this house, though beautifully designed is not mine. You could in fact, say I am a wanderer at this moment. A big, hairy creepy wandering spider destined to live out my years in other peoples’ homes, hoping they don’t squash me when I show up in the wrong place? I certainly hope not! Comparing spiders to humans, my mind roams to the sprawling suburbs so many of us create to house ourselves and our loved ones among our own kind. There are people who live in houses and there are people who roam. I’ve found neither better equipped for the journey of life than the other. It’s just a matter of circumstance. The spider in the web is no more or less connected to nature. Nor are we any less connected to each other by proximity. So, what about the hunter aspect? The spider is a predator to be sure. I guess we’re all hunters in our way. Hunting jobs, hunting food, hunting peace, hunting meaning. You could say the spider is noble. It’s silent. You can’t hear them coming. And in the case of the wandering spider you can’t see where they’ve been. They leave no trace of their existence. Their work is to wander and to eat. They crawl over every obstacle in their path in the same fashion – leg over leg over leg over leg without judgment and without a thought as to whether one obstacle is more or less challenging than another. Speaking of legs, they have eight. They also have eight eyes. This particular type of wanderer is heralded as “a robust, agile hunter with excellent eyesight”. So, what’s the message? What can I take from the company of the wandering wolf and the weaver? Maybe, the question is not about what I can get versus what I can give. I can give space. I can give tolerance. I can give acceptance. I can honor and cherish and none of this costs me a thing. And if I can do all this for the creepy, crawly, hairy ugly giant spiders of the world then I’m guessing it will be that much easier for me to not only give space and tolerance, but to honor and cherish et al. You put your right arm in. You take your right arm out. You put your right arm and you shake it all about. You do the hokey pokey and you turn yourself around. And that’s what it’s aalll aabOUT! Good piece. I finally grew out of my spider phobia and am able to let them continue their lives, although sometimes a little farther away. I hear ya! There is a little one crawling on my computer right now. Sigh. 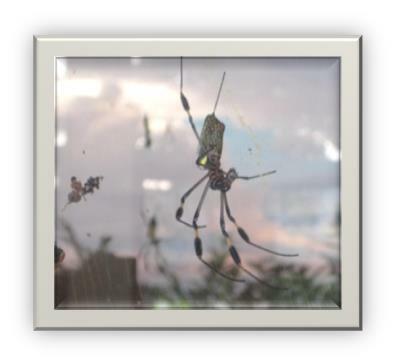 In Indian lore the spider wove the first human alphabet in her web. She tells you to keep writing and to keep journaling to review your progress. And be sure to notice the opportunities on the outside of your web!